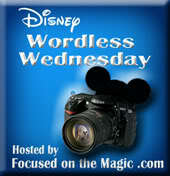 This week the topic for the Wordless Wednesday hosted by Focused on the Magic was Adventure! Animal Kingdom is the first (though, tied with Adventureland in the Magic Kingdom, naturally) when I think about Adventure. The newest area in Animal Kingdom is indeed an adventure waiting to happen! Pandora is full of exotic plants and creatures, both real and imagined as well as the entire landscape being created from something that only existed as CGI. That alone amazes me each time I think about it. Definitely an adventure to explore. While I am not a huge Avatar fan, I can't wait to visit Pandora! I am not either, I thought the movie was just soso, but the world is AMAZING, and the Na'vi River journey was so beautiful and incredible and peaceful, I actually felt sad to the point of a tear it was over. I've never felt that way before. The whole thing is worth a look, even if you aren't a fan. Yes! Now when I think of adventure I think of AK because of Pandora. I loved it before but now there is so much more to explore. I wasn't a big fan of the movie but I love what they've done with the theme. The themeing IS amazing! Those imagineers are so incredibly talented! I have never seen Avatar but this just looks so atmospheric. I can't wait to visit. Luckily, you don't ever have had to see the movie to enjoy Pandora. Just think of it as an exotic, or alien forest!